If you’re in the mood for a classic movie this Christmas, I’ve got several picks for you! 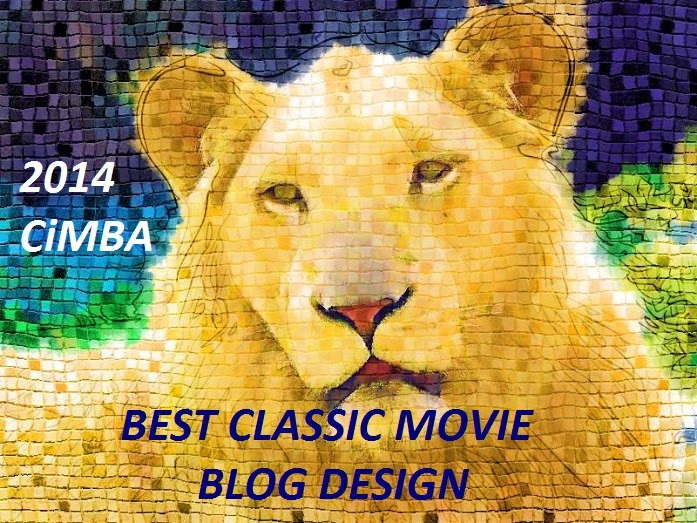 This is my latest installment of Great Classic Films for various occasions and audiences, including my picks for the Fourth of July, Halloween, Date Night, and Classics for Kids. These days, the “Christmas movie” genre is pretty well established, with lots of movies and TV specials about the wonder of Christmas packed with feel-good family cheer. But that wasn’t really a thing in Old Hollywood, so it’s harder to find old Christmas movies that compare to newer models. * But I’ve done my best! This movie follows the Smith family in the year leading up to the 1904 World’s Fair. Although the plot spans a year, Christmas does play an important role, and there are some lovely Christmas trees and snow scenes. Judy Garland is stunning, and never more so than when she sings “Have Yourself A Merry Little Christmas” to a distraught Margaret O’Brien on Christmas Eve. This movie is about family, home, and love, which to me is pretty Christmasy. Here’s the trailer. Click here to buy, and click here to read my full review. Fun fact: Lyricist Hugh Martin’s original lyrics to “Have Yourself A Merry Little Christmas” were much darker; for example, “Have yourself a merry little Christmas / It may be your last/ Next year we may all be living in the past.” But Garland, quite rightly, thought it was too depressing, and that it wouldn’t be appropriate to sing such sad lyrics to little Margaret O’Brien. Another fun fact: when Frank Sinatra wanted to record the song in 1957, he asked Martin to change the lyrics again because Sinatra thought the “Until then we’ll have to muddle through somehow” line was too melancholy. Martin changed it to “Hang a shining star upon the highest bough,” which is the version of the song that most artists record. Mr. Kralik (James Stewart) is the top salesman at the shop around the corner, which happens to be in Budapest. In his spare time, he’s been writing lovely letters to an anonymous woman with whom he is falling in love. 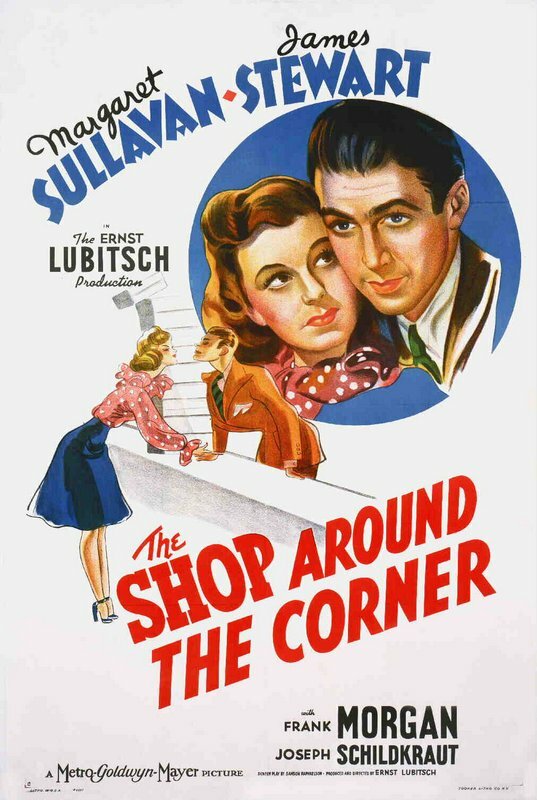 One day, Miss Novak (Margaret Sullavan) walks into the shop, asks for a job, and manages to sell an item that Mr. Kralik had struggled to sell. He’s pretty annoyed. Here’s the trailer, and click here to buy. 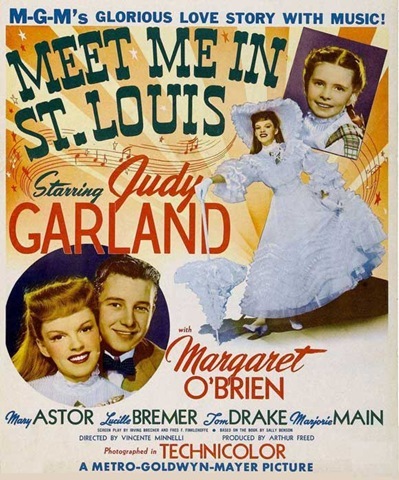 Fun fact: this movie was re-made as the musical In The Good Old Summertime (1949) starring Judy Garland and Van Johnson. Shop also inspired You’ve Got Mail (1998). This movie has a great premise: Elizabeth Lane (Barbara Stanwyck) writes a popular home and cooking column in Smart Housekeeping Magazine. She’s a Martha Stewart-esque domestic goddess, except that she’s making it all up. There is no farm in Connecticut, no husband, no baby, and absolutely no skill in the kitchen. When the magazine’s powerful publisher orders her to host a war hero (Dennis Morgan) for Christmas, and then decides to come stay at the (imaginary) farm, too, she’s left scrambling. Comedy! In all honesty, Christmas could have been replaced with Thanksgiving or Easter and the plot wouldn’t change, but it’s still a fun, romantic film with snow drifts, sleigh rides, and a Christmas tree smothered in tinsel! Here’s the trailer. Click here to buy, and you can read my full review here. Bing Crosby, Rosemary Clooney, Danny Kaye, and Vera-Ellen put on a show to save a friend’s hotel, with poignant WWII connections added to the familiar formula. The movie is packed with Irving Berlin tunes, some tenderly crooned and some marvelously hollered in over-the-top musical numbers. The plot doesn’t really have that much to do with the holiday, but there is a slam-bang finish with huge Christmas trees, miles of tinsel, and longed for snowflakes setting the scene as our stars serenade us with the title song. It can’t fail to get you in the Christmas spirit! Bonus: It’s streaming on Netflix now! Here’s the trailer. You can read my full review here, and click here to buy this great movie. 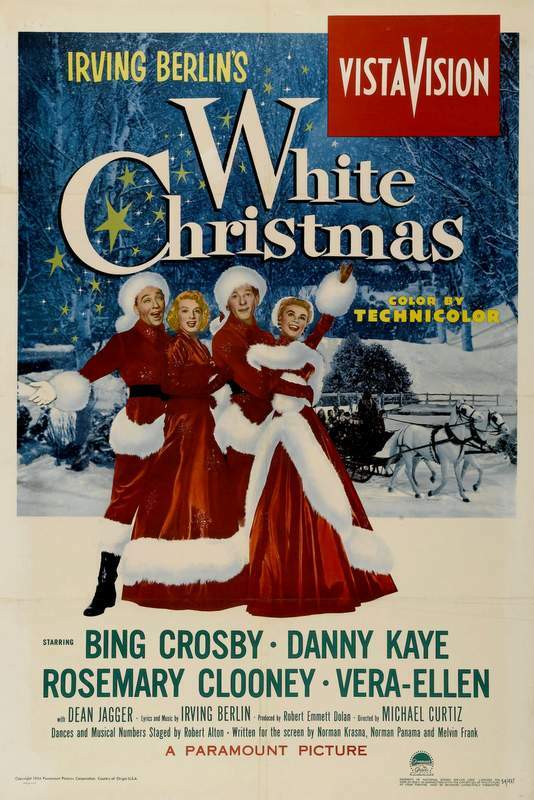 Fun fact: “White Christmas” wasn’t new when Bing Crosby sang it in this film. Irving Berlin wrote the song in 1940, and Crosby sang it on Christmas 1941 on his radio show. Crosby then recorded it in 1942, and he also performed it in the film Holiday Inn (1942). The song topped the charts and won the Academy Award for Best Song. It became the best-selling single in history, a record it held for over five decades until 1997 when Elton John’s “Candle in the Wind” knocked it out of the top spot. A comical murder-mystery may not be your first thought for Christmas, but let me explain. It’s Christmasy because Christmas Eve and morning are highlighted in hilarious party and present opening scenes, and cheerful love abounds between our main characters, happily married couple Nick and Nora Charles. Nick (William Powell) used to be a detective, and Nora (Myrna Loy) wants to see him work, so the pair get drawn into a murder investigation. But the murder can’t diminish their Christmas spirit nor their witty irreverence. So, if you’re in the mood for clever banter and fantastic characters with a splash of Christmas, this is the movie for you. Here’s the trailer. Click here to read my full review, and click here to buy this fun film. 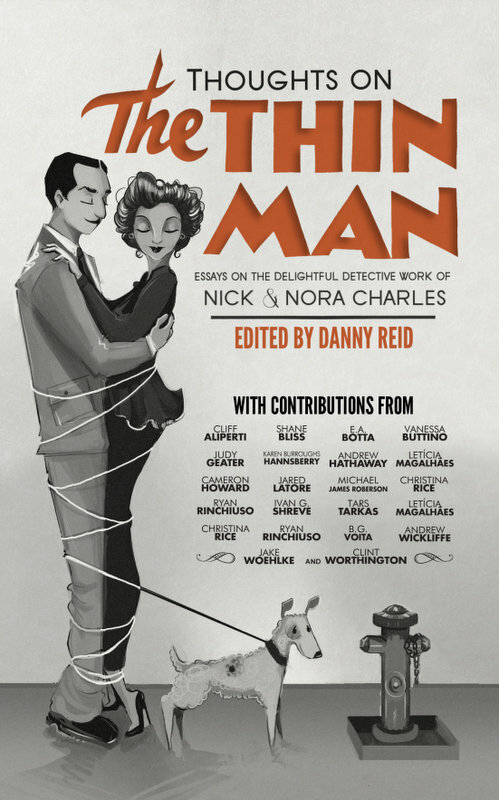 For more on the series, check out Thoughts on The Thin Man: Essays on the Delightful Detective Work of Nick and Nora Charles , which includes an essay by yours truly! 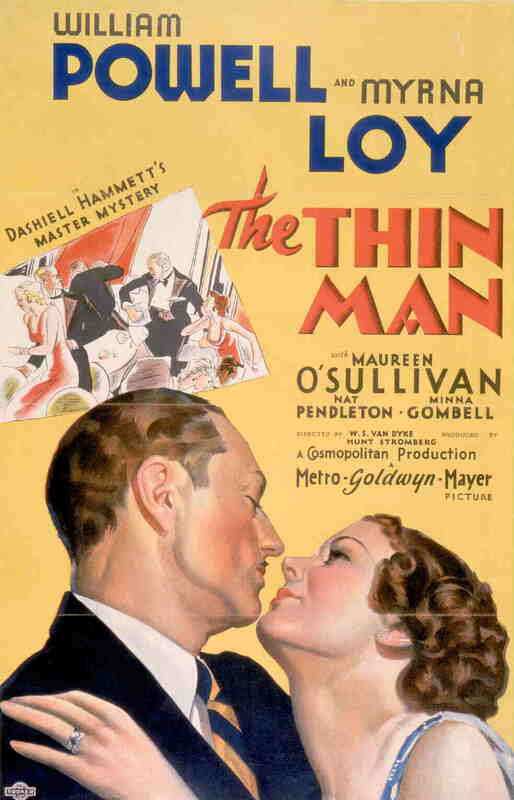 Fun fact: This film and the Loy-Powell pairing was so successful that MGM made five more Thin Man films, and Loy and Powell would work together a total of fourteen times! I’ve been critical of the Christmas content of some of these films, but I find nothing to complain about here. It’s all Christmas, all the time, and so charming. Maureen O’Hara plays Doris, a no-nonsense woman with a very logical 2nd grade daughter named Susan (Natalie Wood). When Doris hires an oddly authentic Santa Claus named Kris (Edmund Gwenn, Foreign Correspondent) to play the part in Macy’s Thanksgiving Day Parade, Doris and Susan’s sensible, well-organized lives get turned upside down. This film is wonderfully done with great performances. It’s heartwarming without being cheesy, and realistic with one foot planted in make-believe. It’s the classic Christmas movie. Here’s the trailer. Click here to buy this classic! 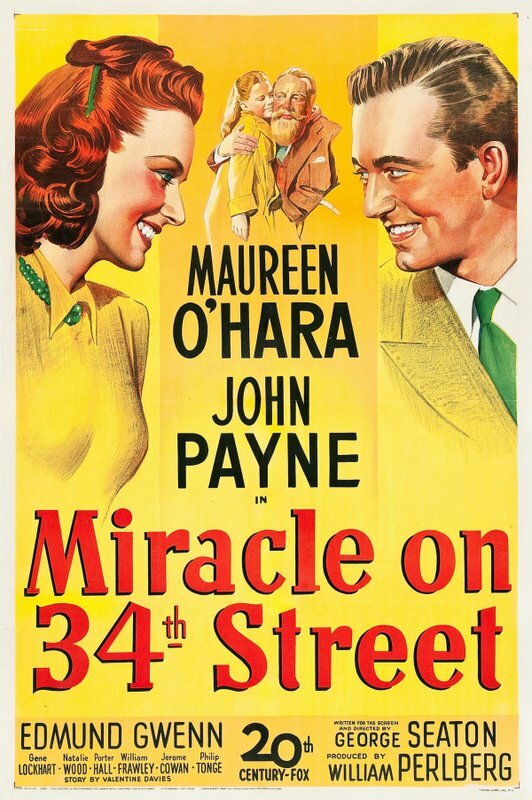 Fun fact: Miracle on 34th Street was released in June to capitalize on the busy summer movie season. So publicity for the film minimized the Christmas aspect, as in this poster where Gwenn’s character is in the background in normal clothes, not his Santa gear. This movie has some poignant Christmas scenes, though otherwise it’s that classic district attorney-brings-accused-criminal-home-for-the-holidays-story. 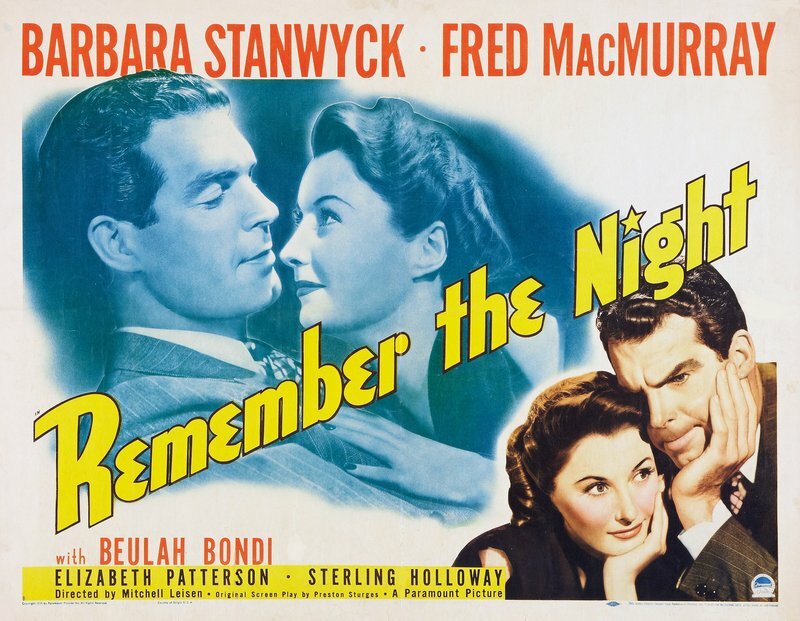 Fred MacMurray is the attorney prosecuting a pretty, definitely not petty, thief (Barbara Stanwyck). When a procedural trick he initiates gets her trial postponed until after the New Year, meaning she’ll have to spend Christmas in jail, he takes pity on her, pays her bail, and offers her a ride home to Indiana. He’ll drop her off with her family and then continue to his own. Things don’t work out as he’d planned though. Shocking, right? Christmas carols at the piano, thoughtful gifts, family time, and softening hearts make this movie holiday-appropriate. Here’s the trailer. Click here to buy. I don’t think I need to say much for this one. Although I’m always surprised at how dark it is, and that it first became a holiday classic because the copyright expired and it was cheap to play on TV, it holds a well-deserved spot as the-gather-round-the-TV family film. 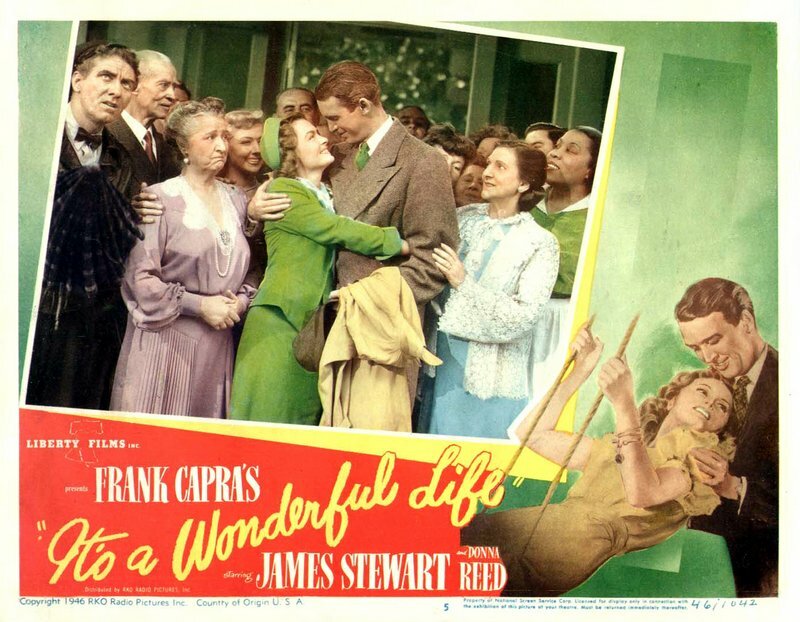 It opens on Christmas Eve as George (James Stewart) is about to commit suicide. An angel is sent to save him, and through flashbacks and alternate outcomes, George is reminded of all the good things he has done and all the lives he has changed. It’s serious and poignant and at times troubling, but required, great viewing. It’s a wonderful film. Here’s the trailer. Click here to buy this Christmas classic. For more, follow me on Twitter, tumblr, pinterest, Instagram and Facebook! As always, thanks for reading! *My hypothesis for this difference is that we celebrate Christmas a bit differently than our grandparents and great-grandparents did in the 1930s-1950s. 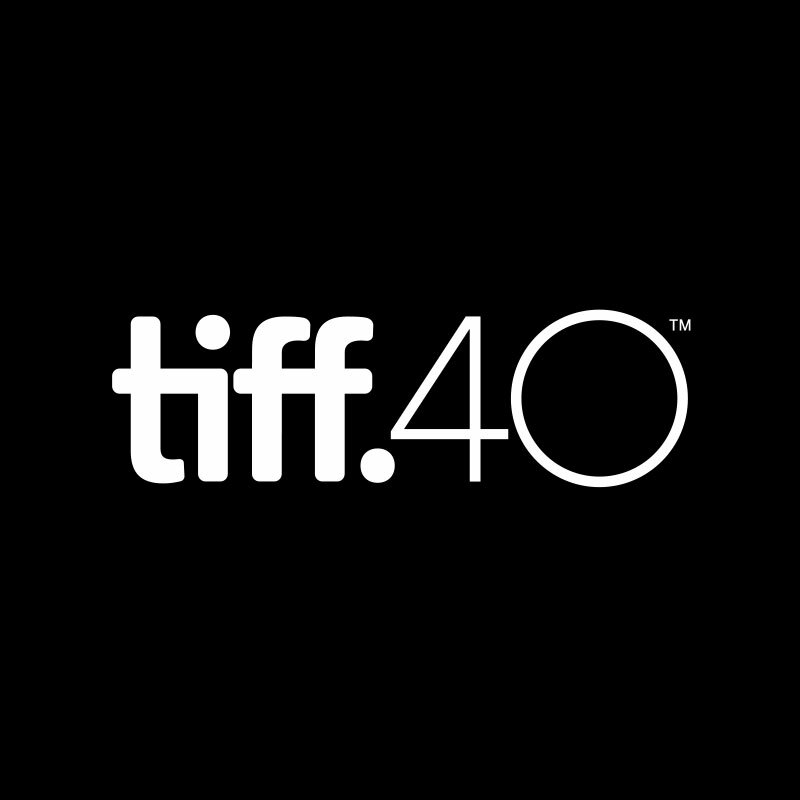 Also, before wide release became the norm in the 1970s (when a movie is released in the majority of theaters across the country at the same time), movies were usually released only in the biggest cities and theaters before slowly trickling into smaller towns and second-run theaters over the next several months or even years. So, for example, a movie might not reach your town until eight months after it premiered in New York City. That makes a “Christmas release” impossible. Case-in-point: White Christmas premiered in October, whereas today, it would almost certainly be slated for a “saturation release,” meaning everywhere, on Thanksgiving Day or a few weekends before Christmas. Remember the Night and especially Christmas in Connecticut are both great favorites of mine . . . and it’s just registered on me that they both star Barbara Stanwyck. I wonder if that’s just coincidence? Thank you! 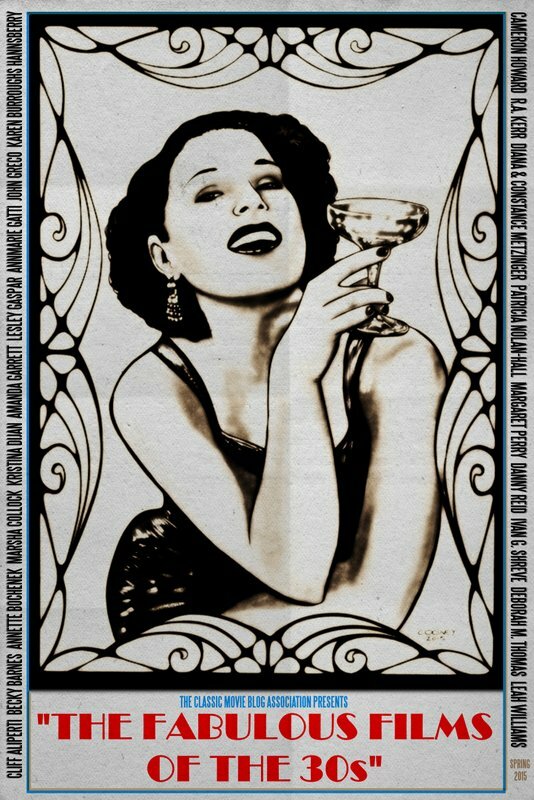 It shows what versatility Miss Stanwyck possessed! 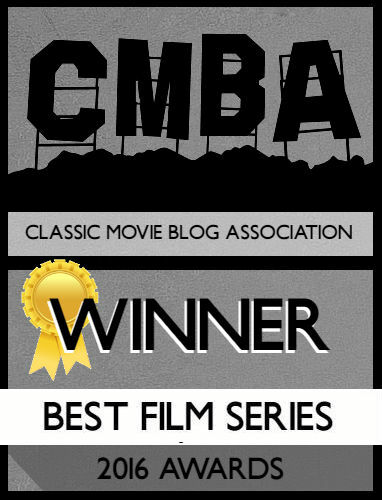 Film noir, drama, comedy, and Christmas! Thanks for reading! Great selections! Some of my very favorites are on your list, and “Meet Me in St. Louis” and “The Shop Around the Corner” would also top mine. I’ve always preferred “Holiday Inn” to ” White Christmas” (the idyllic “Christmas in Connecticut” set always reminds me of the “Holiday Inn” set) but it’s been a while since I’ve seen “White Christmas.” Probably should give it another look. I need to give Holiday Inn another look. For some reason it’s never been a favorite, but I haven’t seen it in a few years! Thanks for reading! Great choices here! I especially love the two James Stewart classics you have picked out here, and’ Meet Me In St Louis – also recently enjoyed ‘Remember the Night’. 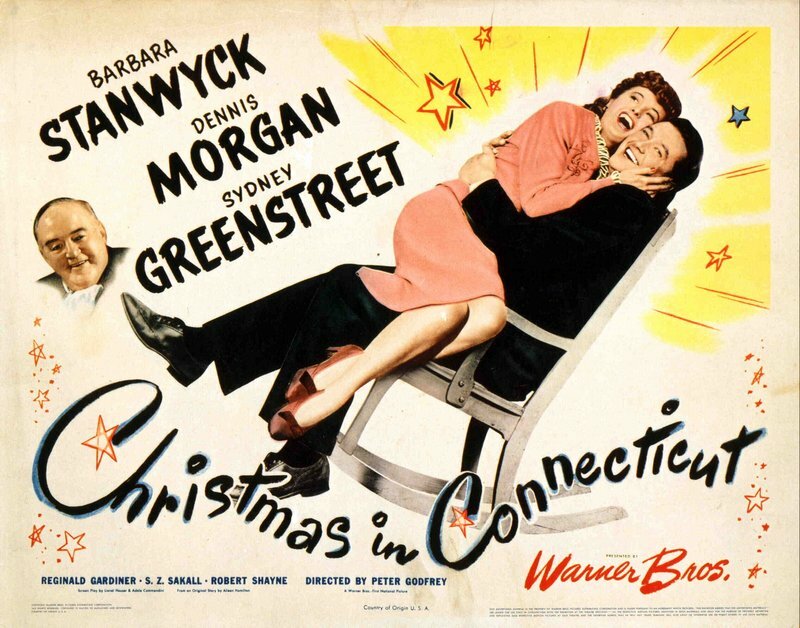 I haven’t seen ‘Christmas in Connecticut’ as it’s not available in the UK – but I have been meaning to see it and will aim to do so before next Christmas! Thank you, glad you like the list! 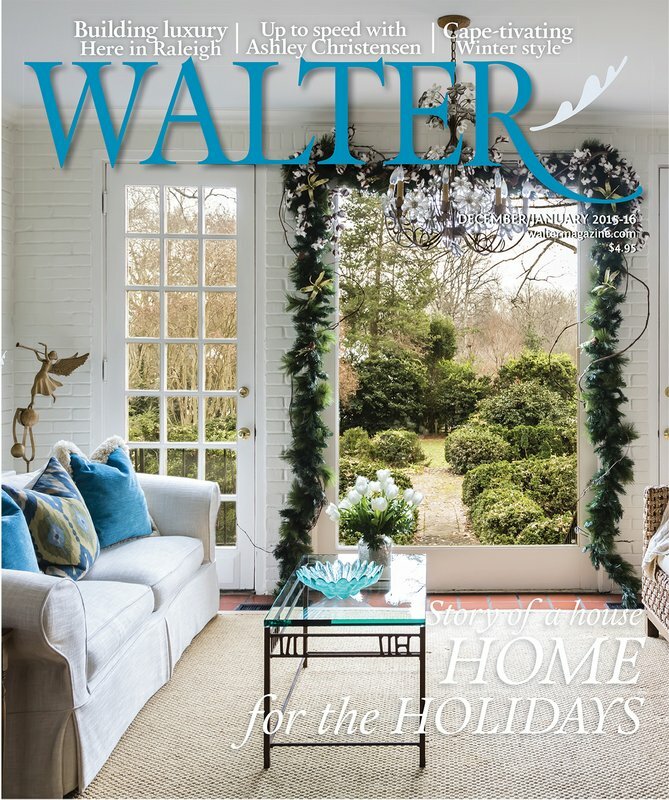 Hope you can find Christmas in Connecticut soon!